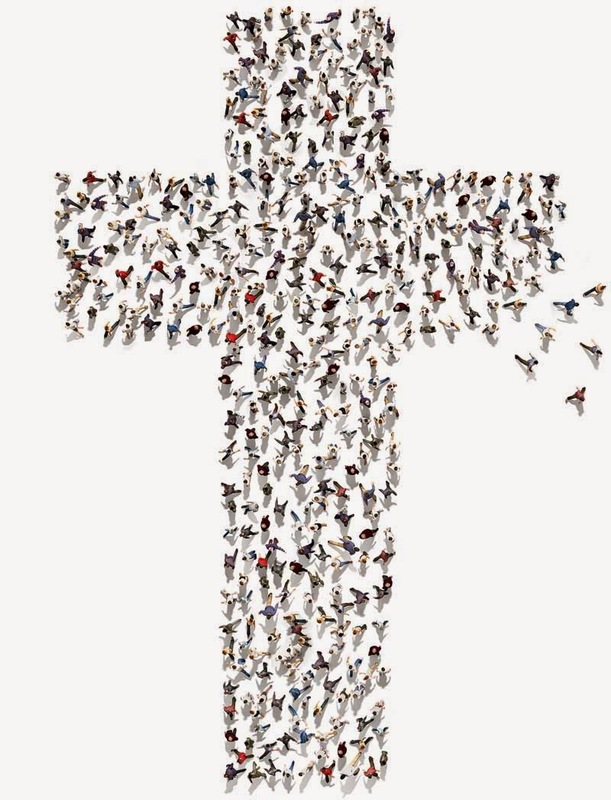 Yesterday I saw the front cover of Chicago Magazine featured this headline story: Catholics at a Crossroads: More Chicagoans than ever are leaving the church. Can new archbishop Blase Cupich change that? Add in Mercy Home for Boys & Girls, Misericordia (a group home for the developmentally disabled), 17 Catholic hospitals, and Catholic Charities (which offers over 150 services in 160 locations), and “there’s no single entity beyond the State that does more for Chicagoans than the Catholic Church,” says Robert Gilligan, executive director of the Catholic Conference of Illinois and the archdiocese’s chief lobbyist in Springfield. I've added a rather lengthy comment to the article in the comment box. 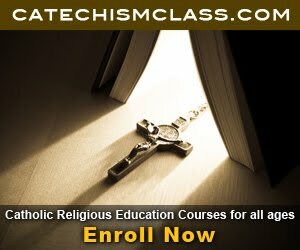 I encourage you to add your own comments, especially fellow Catholics in Chicagoland. Let's take a stand for Tradition. Continue here. 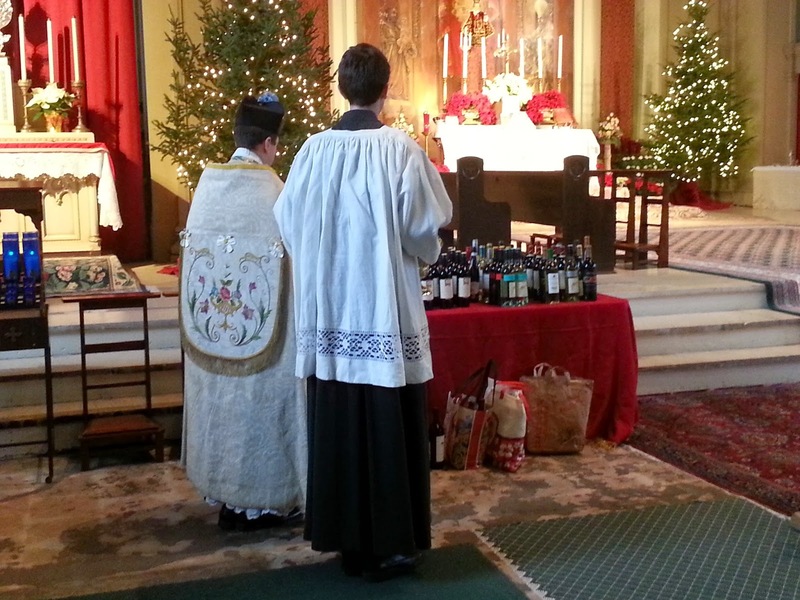 Today is the annual Blessing of Wine for the Feast of St. John. Read more here. 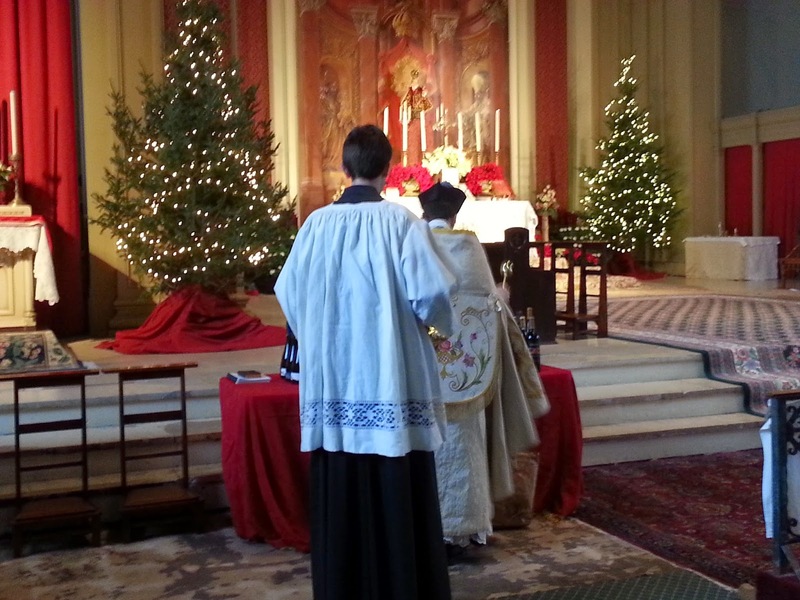 Photos were taken this morning at the Shrine of Christ the King in Chicago. UPDATE: RESULTS ARE IN. SCROLL DOWN. I RECEIVED ST. PADRE PIO, WHO I HAVE BECOME MORE DEVOTED TO IN RECENT MONTHS (MY FATHER IS VERY DEVOTED TO HIM). JUST LAST MONTH I VENERATED THE BANDAGES THAT COVERED HIS STIGMATA ON HIS HAND. UPDATE (1/3/15): DRAWINGS WILL CONTINUE TO TAKE PLACE ON SUNDAYS IN JANUARY. PLEASE FEEL FREE TO CONTINUE TO ENTER NAMES UNTIL THE END OF JANUARY. UPDATE (1/11/15): TODAY'S DRAWING IS COMPLETE AND THE LIST OF RESULTS IS UPDATED BELOW. THANK YOU FOR EVERYONE FOR YOUR SUPPORT AND PARTICIPATION. LET US PRAY FOR A HOLY YEAR, A YEAR TO LEARN MORE ABOUT OUR PATRON SAINT FOR A YEAR. 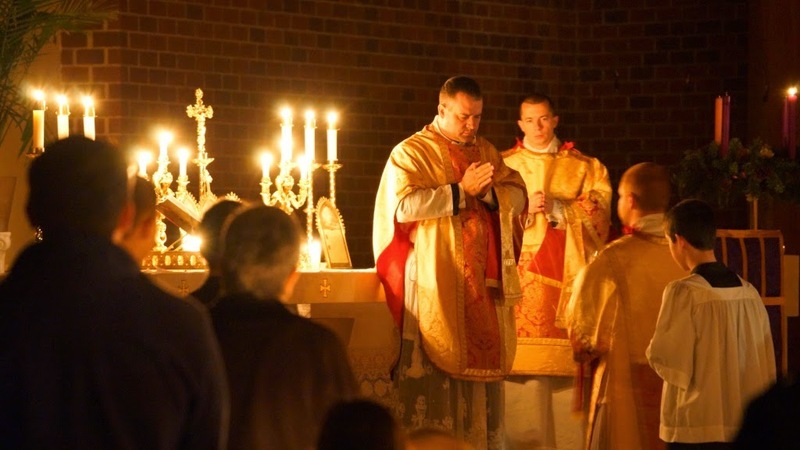 LET US IMITATE THEIR VIRTUES AND STRIVE FOR A LIFE MOST PLEASING TO OUR LORD JESUS CHRIST. 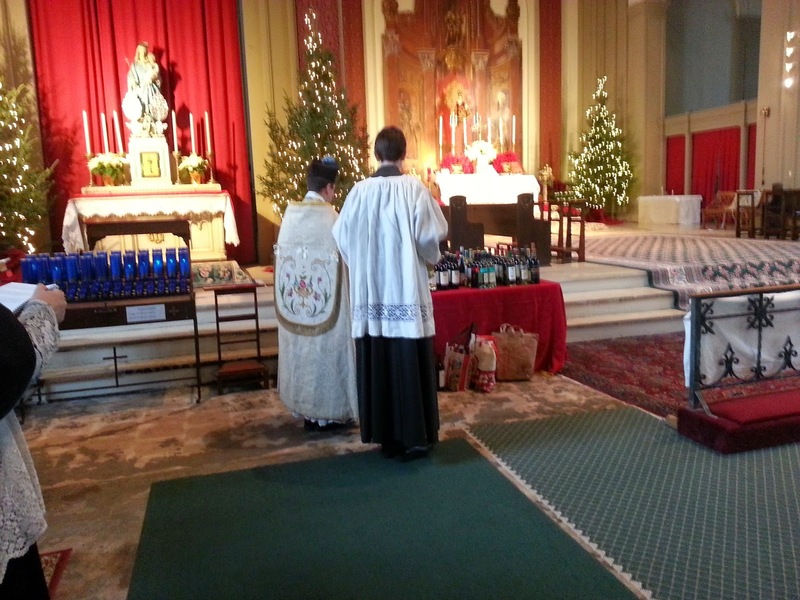 I am very pleased to again be a facilitator for the Patron Saint of the Year Devotion. I have been part of this annual tradition since 2006 and have helped coordinate devotions for hundreds of families. 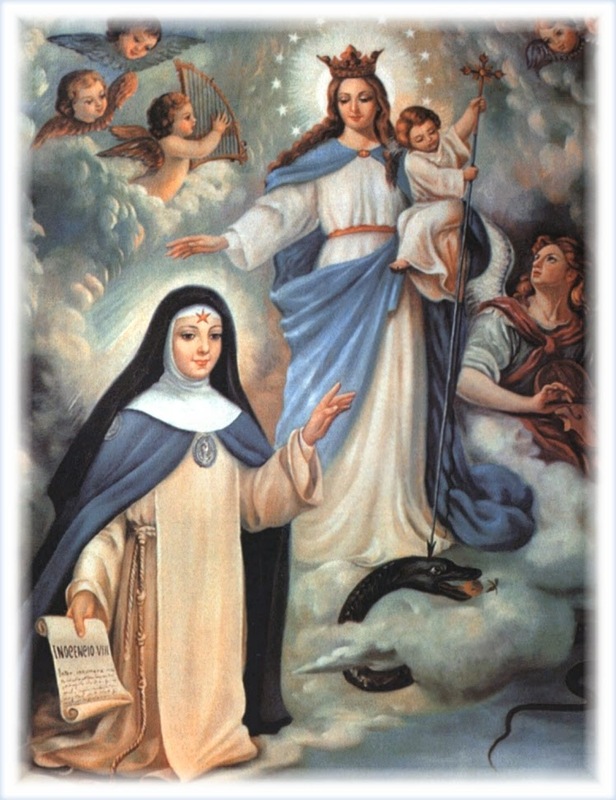 It is my pleasure to now be part of the 2015 Patron Saint of the Year Devotion. When will the saints be drawn? 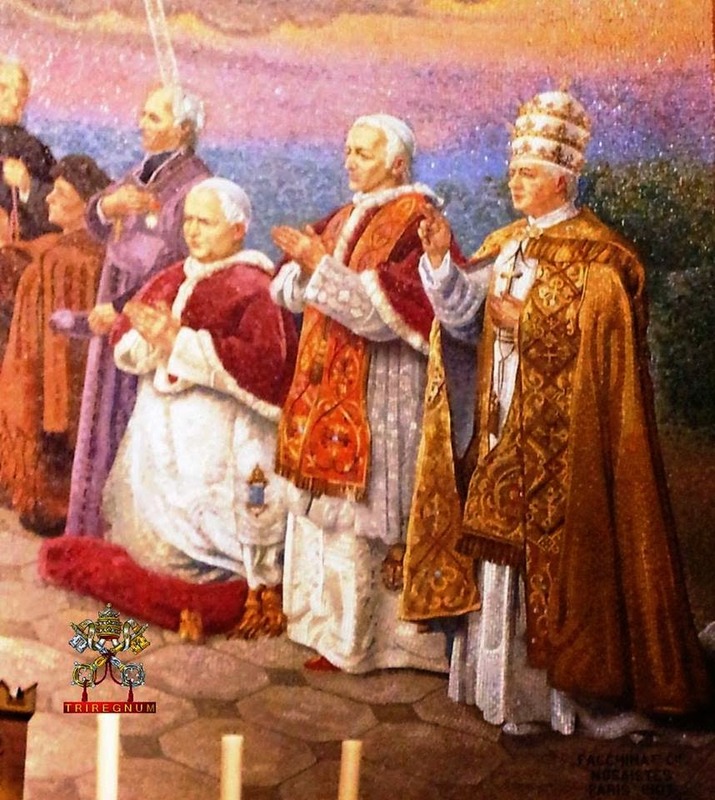 This year I will start the drawing of saints on the Octave Day of Christmas after the 10 AM Solemn High Mass and the recitation of both the Veni Creator Spiritus and the Litany of Saints. Saints will be emailed starting that afternoon and thereafter for the next few days. If you are not familiar your saint, I encourage you to research online and even pick up a copy of Father Hugo Hoever's "Live of the Saints," from which I read daily. 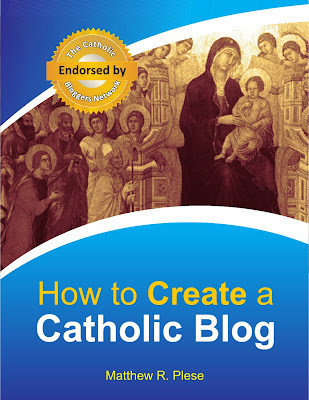 While the book does not include saints canonized in recent years, it is something that I am highly recommending. Indeed, it was He who came to save men, hence his name Jesus, which means “savior”. He is also called Lord—Dominus—for He is the King of kings, and individuals and societies need Him. 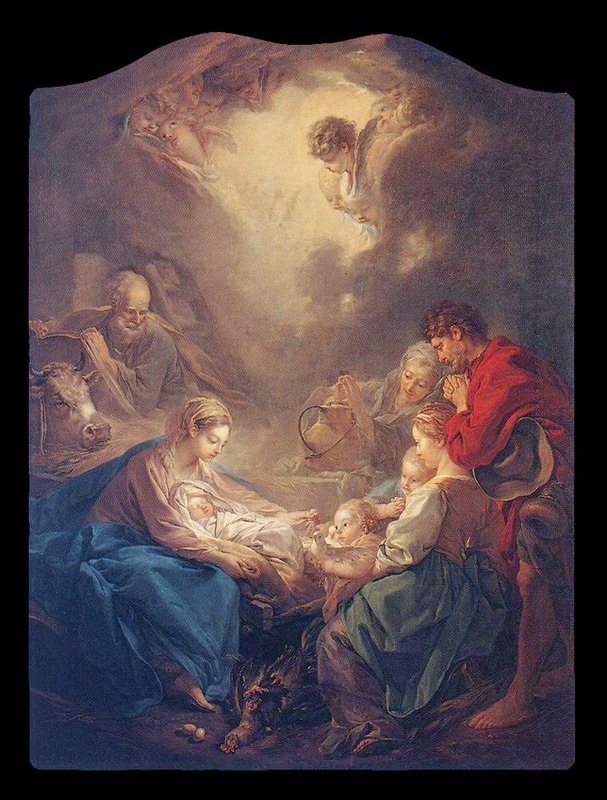 And he quoted Cardinal Pie’s words to Napoleon III: “If the time has not come for Jesus Christ to reign, then the time has not come for governments to last.” The Child of the creche is the Lord, who gives stability and peace. I will greatly rejoice in the Lord, and my soul shall be joyful in my God: for He hath clothed me with the garments of salvation, and with the robe of justice He hath covered me, as a bride adorned with her jewels. (Ps. 29: 2) I will extol Thee, O Lord, for Thou hast upheld me: and hast not made my enemies to rejoice over me. v. Glory be to the Father and to the Son and to the Holy Ghost, as it was in the beginning, is now and ever shall be, world without end. Amen. Lesson from the Book of Wisdom: Proverbs. The Lord possessed me in the beginning of His ways, before He made anything, from the beginning. I was set up from eternity, and of old, before the earth was made. The depths were not as yet, and I was already conceived neither had the fountains of waters as yet sprung out; the mountains with their huge bulk had not yet been established: before the hills I was brought forth He had not yet made the earth, nor the rivers, not the poles of the world. When He prepared the Heavens, I was there when with a certain law and compass He enclosed the depths; when He established the sky above, and poised the fountains of waters; when He compassed the sea with its bounds, and set a law to the waters that they should not pass their limits; when He balanced the foundations of the earth; I was with Him, forming all things, and was delighted every day, playing before Him at all times, playing in the world: and my delight is to be with the children of men. Now, therefore, ye children, hear me: blessed are they that keep my ways. Hear instruction, and be wise, and refuse it not. Blessed is the man that heareth me, and that watcheth daily at my gates, and waiteth at the posts of my doors. He that shall find me, shall find life, and shall have salvation from the Lord. Thanks be to God. Blessed art thou, O Virgin Mary, by the Lord the most high God, above all women upon the earth. V. (Judith 15: 10) Thou art the glory of Jerusalem, thou art the joy of Israel thou art the honor of our people. Alleluia, alleluia. V. (Canticles 4: 7) Thou art all fair O Mary, and there is in thee no stain of original sin. Alleluia. At that time, The Angel Gabriel was sent from God into a city of Galilee, called Nazareth, to a virgin espoused to a man whose name was Joseph, of the house of David: and the virgin's name was Mary. And the Angel being come in, said unto her: "Hail, full of grace, the Lord is with thee: blessed art thou among women." Hail Mary, full of grace; the Lord is with thee; blessed art thou among women. Alleluia. SECRET Receive the saving Victim we offer to Thee, O Lord, on the solemn feast of the Immaculate Conception of the Blessed Virgin Mary: and grant that, as we confess that by Thy preventing grace she was kept free from every stain of sin; so, by her intercession, we may be delivered from all our offenses. Through our Lord Jesus Christ, Thy Son, Who liveth and reigneth with Thee in the unity of the Holy Ghost, one God Forever and ever..
Glorious things are told of thee, O Mary, for He who is mighty hath done great things unto thee. POST COMMUNION - May the Sacraments which we have received, O Lord, our God, heal in us the wounds of that sin, from which Thou didst alone preserve the Immaculate Conception of Blessed Mary. Through our Lord Jesus Christ, Thy Son, Who liveth and reigneth with Thee in the unity of the Holy Ghost, one God Forever and ever. In an update to my posts on the topic, I also have these titles for sale. Prices include shipping. 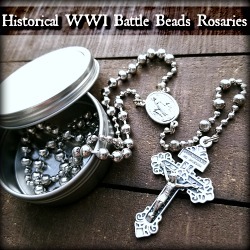 Please email me at acatholiclife[at]gmail[dot]com for more information or to order. The Greek Catholic church of Saint George was in ruins 6 months ago when the town of Nabak was still a terrorist stronghold. 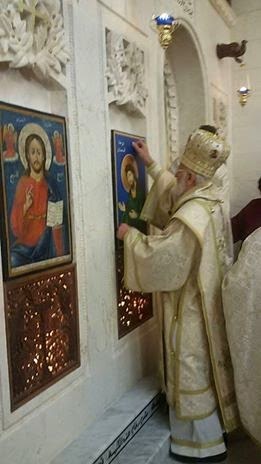 Since then reconstruction was achieved and the Patriarch visited its Christian community. 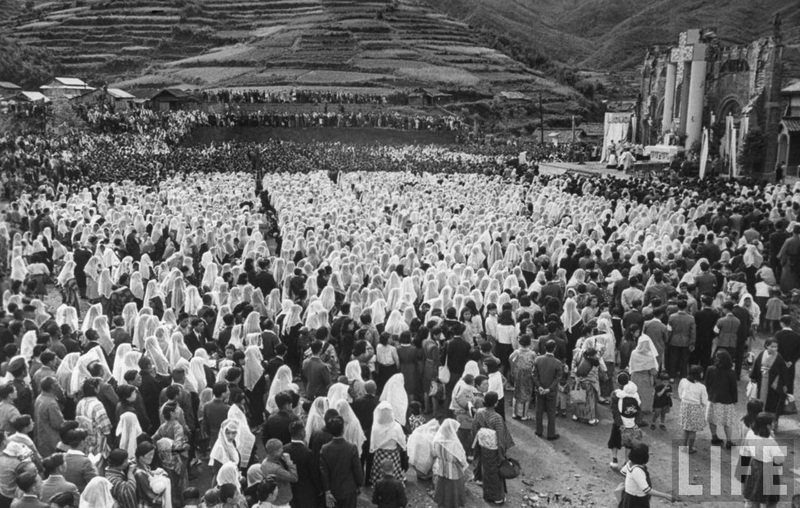 = the 150th of the events predicted by Our Lady at La Salette: "In the year 1864, Lucifer together with a large number of demons will be unloosed from hell; they will put an end to faith little by little, even in those dedicated to God; they will blind them in such a way, that, unless they are blessed with a special grace, these people will take on the spirit of these angels of hell; several religious institutions will lose all faith and will lose many souls". 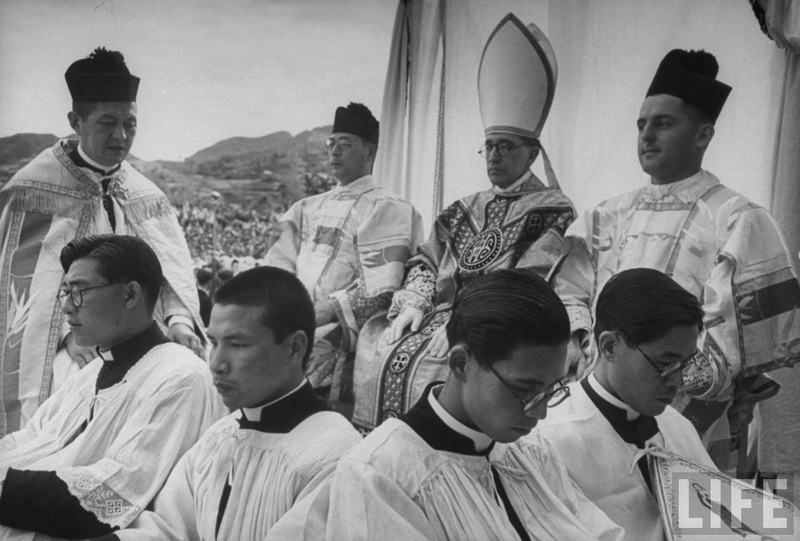 = the 40th of Abp. Lefebvre's historical Declaration of November 21, 1974. Today is the Feast of the Translation of the Holy House of Loretto (Mass in Some Places). Towards the end of the thirteenth century, the terrible news reached Europe that the Holy Land was lost to the Christians, who during two centuries had been able to maintain the Latin kingdom there by virtue of their repeated Crusades. 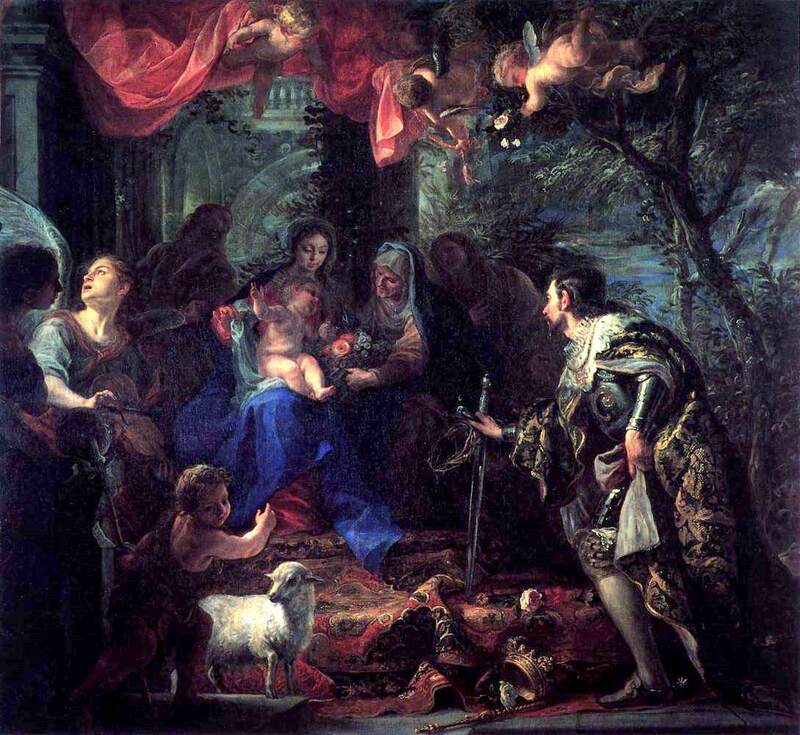 But at the time the Church was deploring this painful loss, a new joy was given them: the holy house of Nazareth — site of the birth of the Mother of God, of Her early education and of the Annunciation by the Angel Gabriel of the wondrous news of the Incarnation of the Son of God — had been found, transported miraculously, near Tersatz in Dalmatia (Yugoslavia) on May 10th of the year 1291. Between Tersatz and nearby Fiume, the residents of the region beheld one morning an edifice, in a location where never had any been seen before. After the residents of the region talked among themselves of the remarkable little house surmounted by a bell tower, and which stood without foundations on the bare ground, describing its altar, an ancient statue of Our Lady, and other religious objects which their wondering eyes had seen within it, another surprise came to astound them once more. Nicolas Frangipane, governor of the territory of Ancona, was absent, but when the news was carried to him, he returned from a war in order to verify its authenticity. 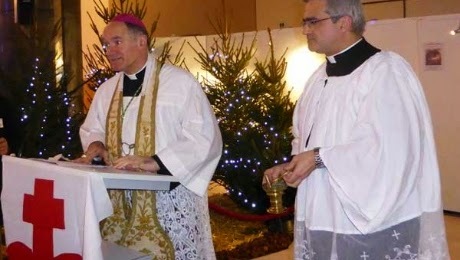 He sent to Nazareth, at the eastern limits of the Mediterranean Sea, the bishop and three other persons, to examine the original site of the house. Indeed the house was no longer there, but its foundations remained and were found conformable in every detail of dimension and substance, to the stones at the base of the house now in Dalmatia. The testimony of the delegates was drafted according to legal formalities, and confirmed by a solemn oath. Then, after three years spent in Dalmatia, the house disappeared. 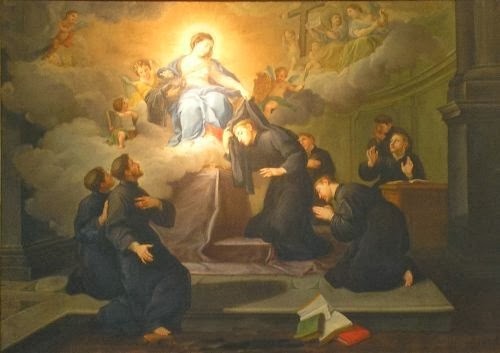 Paul Della Selva, a holy hermit of that period and of the region of Ancona, wrote: “During the night of December 10th, a light from heaven became visible to several inhabitants of the shores of the Adriatic Sea, and a divine harmony woke them that they might contemplate a marvel exceeding all the forces of nature. They saw and contemplated a house, surrounded by heavenly splendor, transported through the air.” The angelic burden was brought to rest in a forest, where again the local residents were able to contemplate the signal relics which it contained. The antique Greek crucifix mentioned by Our Lady was made of wood, and attached to it was a canvas on which the words Jesus of Nazareth, King of the Jews, were painted. The cedar statue of the Virgin had been painted also; she wore a red robe and a blue cloak and held the Infant Jesus in Her arms. His right hand was raised in blessing; His left hand held a globe, symbol of His sovereign power. 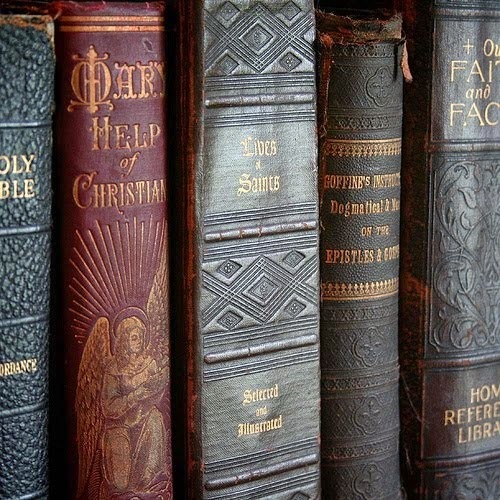 The episodes concerning the Translation of the Holy House, all duly verified, were consigned in documents borne to Rome to the Sovereign Pontiffs at various epochs. Pope Sixtus IV declared that the house was the property of the Holy See, and assigned duties to a specified personnel named to be its custodians. By Pope Leo X the indulgence applicable to the visit of several churches of Rome was accorded also to a pilgrimage to Loreto. Eventually a magnificent basilica was built around the house, which within the basilica was itself enhanced by a white marble edicule. Pope Clement IX in 1667, placed the story of the House in the Roman Martyrology for the 10th of December under the title: At Loreto, in the territory of Ancona, translation of the Holy House of Mary, Mother of God, in which the Word was made flesh. Pope Benedict XIV, a prodigious scholar before he became Pope, established the identity of the house with that of Nazareth, against its detractors, and later worked for the embellishment of the August sanctuary. 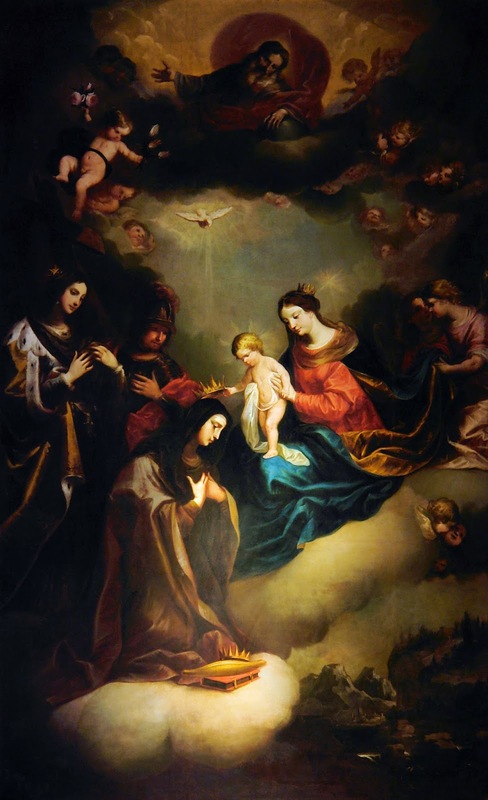 The feast of Our Lady of Loreto is observed in many provinces of the Church, inscribed in the Proper of their dioceses by their bishops. Sources: Les Petits Bollandistes: Vies des Saints, by Msgr. Paul Guérin (Bloud et Barral: Paris, 1882), Vol. 14; Magnificatmagazine, Vol. XXIX, no. 12, December 1994, pp. 260-264 (Magnificat: Saint Jovite, 1994); La Sainte Maison de la Sainte Vierge, by a priest of Montreal (Librairie Saint Joseph: Montreal, 1895). O God, who through the Mystery of the Word made flesh, didst in Thy mercy sanctify the House of Blessed Mary the Virgin, and by wondrous means didst place it in the care of Thy Church, grant that we may keep aloof from the tabernacles of sinners, and become worthy habitants of Thy holy house. Through the same our Lord . . .
“Drop down dew, ye heavens, from above, and let the clouds rain the just: let the earth be opened and bud forth a Saviour. 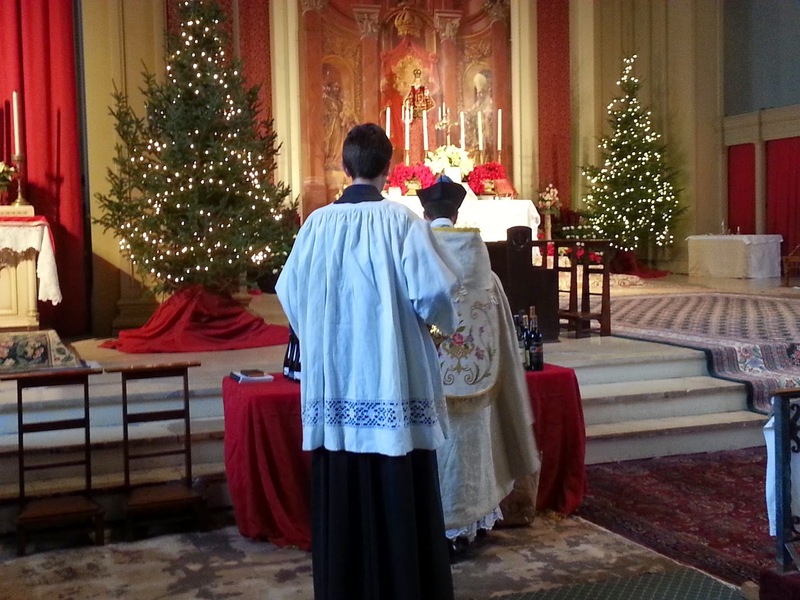 Ask your priest to offer one this Advent! Photos and information excerpted from One Peter 5. 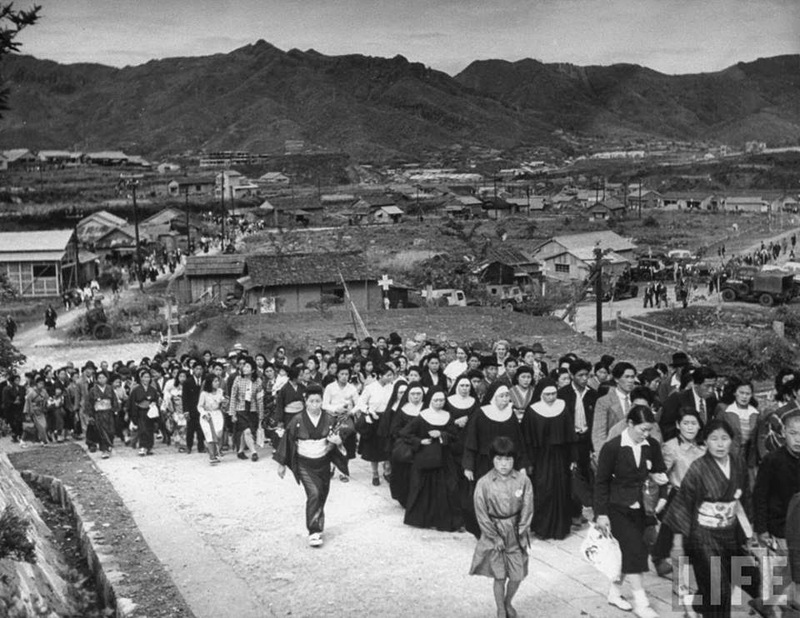 The following are photos of a Pontifical Solemn High Mass said on the 400th Anniversary of the Arrival of St. Francis Xavier to Japan, and a Requiem Mass for the victims of the Bombing of Nagasaki in the midst of the ruins of the Cathedral of Saint Mary of Urakami, 1949. Notice the reverence of the Mass even in such destruction - something you would be hard pressed to find in the modern Church. Today is Friday, the day in which we commemorate Our Lord's passion and death. It was our own sins that condemned our glorious Lord to death on Good Friday - death on a Cross. 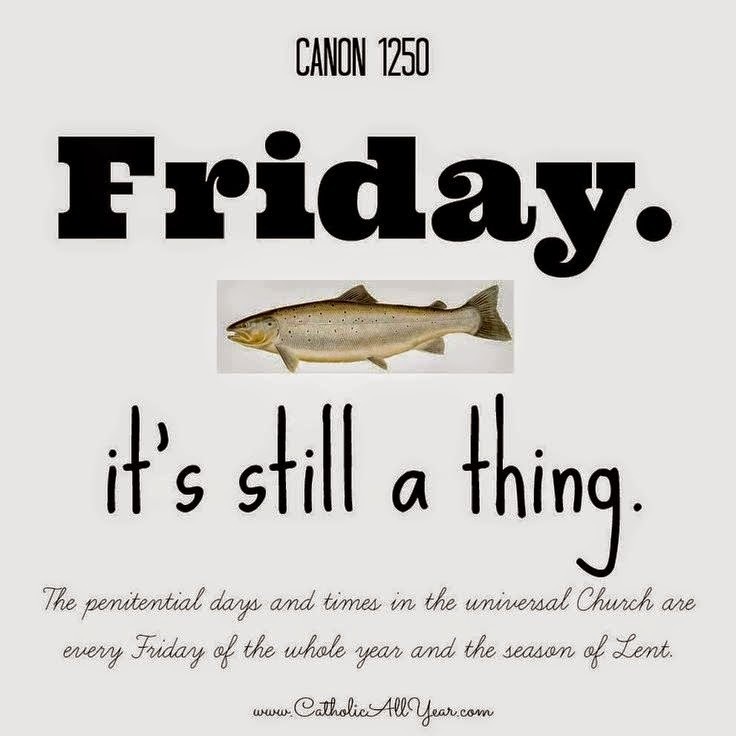 As Catholics, we are still bound to either abstain from meat or rather to do some act of penance each Friday in the entire year. It was on this day of the week that our glorious Redeemer died for us. Please, never forget this, especially at 3 o'clock, the hour that He died. 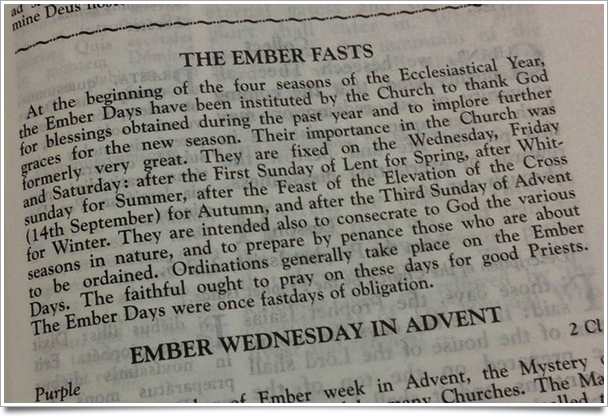 At 3 o'clock attempt to pray the 3 o'clock Mercy Prayer. Please remember Our Lord's love and repent today. 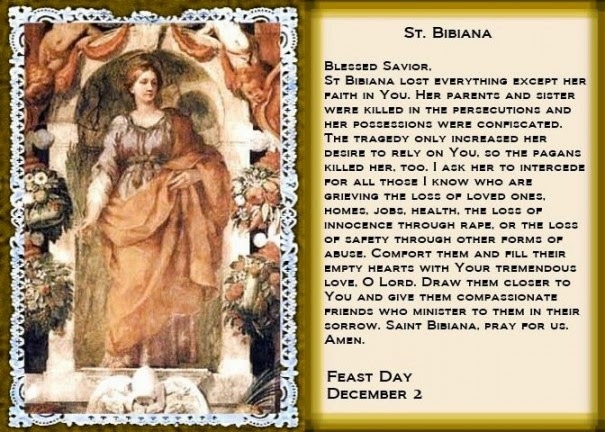 On December 2nd the Church commemorates the life of St. Bibiana. 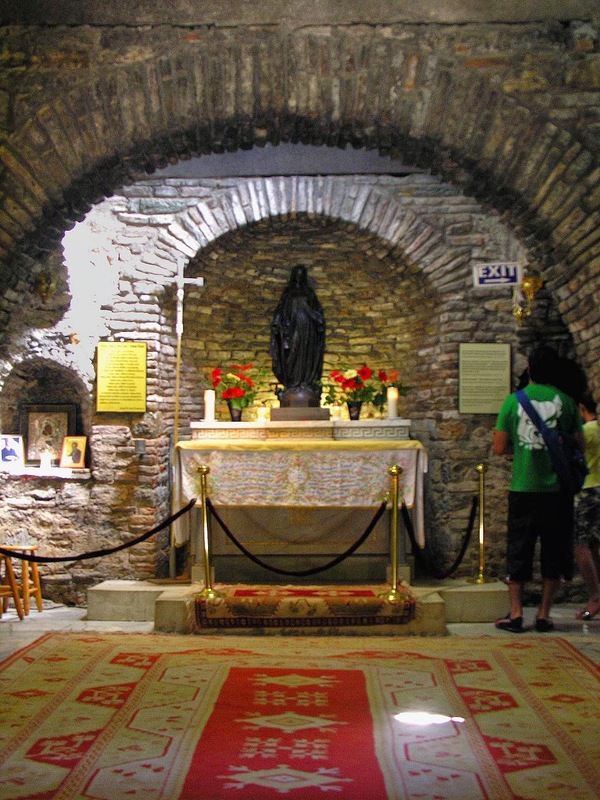 As Tradition relates, St. Bibiana was the daughter of the Christians Flavian and Dafrosa. Flavian was tortured and sent into exile where he died, and Dafrosa was beheaded. All of this occurred under the rule of Apronianus as Governor of Rome - he was made Governor by Julian the Apostate in 363. The daughters of these two martyrs were Bibiana and Demetria. Demetria, after confessing her Faith in the Catholic Faith, was slain. Bibiana was put to great sufferings as she was placed under the seduction of a wicked woman named Rufina. As St. Bibiana refused to give in to the assaults, the saint was ordered to be tied to a pillar and beaten with sourges, laden with lead. And so, the saint was viociously beaten to death for her Faith in Christ, all the while suffering in joy, knowing that by so doing, she would receive the Crown of Martyrdom. O God, the giver of all good gifts, You united the grace of virginity and the palm of martyrdom in the blessings conferred upon Your servant Bibiana. Unite our souls to You by love Through the intercession of this saint, so that we may be shielded from all danger and obtain the rewards of eternity. Through Our Lord . . .